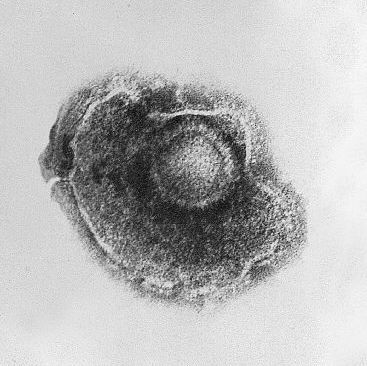 The varicella zoster virus (VZV) belongs to the Herpesviridaefamily that is responsible for varicella (chickenpox and shingles). Like all viruses in the Herpesviridae family and particularly in the Varicellovirusgenus, VZV has a linear double-stranded DNA genome. Its 125,000 nucleotides code for many proteins, expression of which is finely controlled depending on the time of the viral cycle (early and late genes). The DNA is protected by a capsid that is in turn surrounded by a layer of integument covered by a lipid membrane in which the viral proteins are anchored. The viral particle is spherical, approximately 150 to 200 nanometres in diameter. The virus can survive outside the host for short periods of time in secretions, air droplets, or on inert substances. VZV is highly transmissible, affecting almost 90% within a family environment. Primary VZV infection results in the person being immunised. It replicates actively and leaves the infected cell by budding from the membrane. The lytic cycle develops in the primary infection in respiratory tract and skin cells. After primary infection, the virus reaches the nerve cell where the latent cycle becomes established. The virus DNA, which then forms a circular episome, replicates passively in cell mitosis using cell enzymes. VZV can reactivate after a few years and return to the skin causing the illness known as shingles.